Daniel Zimmermann on the Mini-Moonflower. Alaska is huge. At over 586,400 square miles it is 1/5 the size of the entire United States and larger than the next four largest states combined. It is no surprise that Alaska has one of the greatest climbing arenas on earth. The Alaska Range is one of the world’s finest mountain environments and North America’s premier alpine climbing destination. At 20,320 feet, the continent’s highest peak, Denali is the central focus of the range. Because of the lure of climbing to this lofty point, a network of easy access has been created to allow climbers to explore the magnificent peaks surrounding Denali as well. This area, referred to as the Central Alaska Range, contains some of the biggest, baddest, and steepest peaks to be found anywhere. Expert climbers from around the world come here year after year to put their skills to the test. But the range is certainly not limited to the elite. An array of easier peaks and “back-side” routes makes it just as appealing to novice and intermediate climbers. Climbing amongst the splendor of these mountains is a delight for all. 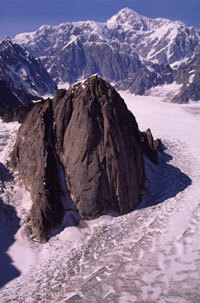 The mountains of the Central Alaska Range contain incredibly diverse types of climbing all in a relatively close area. On the same day only 15 miles apart, climbers in the Ruth Gorge may be cruising up 10-pitch rock routes in short sleeves, while climbers high on Denali may be struggling up difficult ice and mixed terrain in desperate conditions. In these mountains there is something for everyone: high-altitude mountaineering, technical ice and mixed climbing, big wall climbing, alpine rock climbing, cragging, and ski touring. It is common for climbers to show up on the glacier with rock shoes and a chalk bag in addition to their ice tools and ice screws. While it is true that the Alaska Range has a reputation for having poor weather and brutal storms, when the weather is good, the rewards of being here are immeasurable. The expansive glaciers, rugged summits, and pristine ridge lines will forever be impressed in your memory. And the huge Alaskan scale of these mountains continually astounds all that visit. The path to climbing in Alaska has changed immensely since the days of Belmore Browne who mushed dogs from Seward to reach the Muldrow Glacier months later. These days simply hop on a jet-liner to the booming metropolis of Anchorage, Alaska. A few adventuresome folk prefer to drive to Alaska each season. Pick up The Milepost magazine for the best driving beta available. If you’ve purchased all of your food prior to the trip and do not need anything in Anchorage, it is possible to have a shuttle van pick you up at the airport and deliver you directly to Talkeetna. Make sure your flight schedule matches your shuttle company’s pick-up schedule. The driver may be able to make a few short stops, but this should be arranged with the company in advance. Another option is to take the Alaska Railway directly to Talkeetna or Denali Park. The train is definitely a pricey option, but it is a neat way to experience Alaska. Although the train goes directly to the Anchorage International Airport, this service is reserved for tourist groups only. To catch the train it is necessary to travel 20 minutes by bus or taxi to the Anchorage Depot. The People Mover bus is a good way to get around town. With airline baggage limits so restrictive these days, many climbers (especially international climbers) find it easier to take a day in Anchorage to complete their expedition food and gear shopping before heading up to Talkeetna. A good option is to rent a car at the airport for a day and complete all your necessary shopping, then have the shuttle service come and pick you up. An overnight stay at one of the youth or climbing hostels can also be arranged. Check out Earth Bed and Breakfast for the best climber friendly accommodations. Lori and Angel go out of their way to welcome climbers from all over the world. Chris McNamara on The Eye Tooth. While there are numerous locations to get supplies around Anchorage, the following combination of businesses will carry everything you need for an Alaskan expedition. Costco: $45 membership required. Good cheap source for staple foods needed in large quantities. Bulk batteries and cheap calling cards also available. Fred Meyer: General grocery outlet and multi-department store. The Brown Jug liquor store is attached as well as a bank and ATM. Natural Pantry: Health food and bulk food store. New Seguya: Excellent source for specialty and gourmet foods. 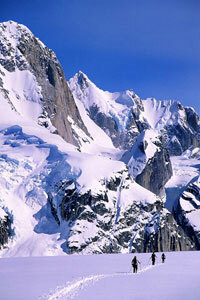 Alaska Mountaineering and Hiking (AMH): Local dealer of climbing and outdoor gear and clothing. Recreational Equipment Incorporated (REI): Climbing and outdoor gear and clothing. If in search of some good food and entertainment in Anchorage, stop by either the Moose’s Tooth Pub and Pizzeria or the Bear Tooth Theatrepub & Grill. Both are fun and popular spots with great food and variety. Also the Middle Way Café (right next to REI) and the Organic Oasis both serve excellent vegetarian and vegan cuisine. From Anchorage, follow Alaska Highway 1 north 35 miles to the junction of Highway 3 just east of the town of Wasilla. Turn on Highway 3 north (the George Parks Highway) and follow it another 64 miles to the Talkeetna Spur Road junction. Take a right and follow the Spur Road 14 more miles to Talkeetna. The drive takes about 2.5 hours. Talkeetna is a wonderful little community with a rich Alaskan history. Originally a railroad supply depot on the way to gold mining claims farther north, the Talkeetna townsite was established in 1919. The economy nowadays is largely tourist driven with many activities such as fishing, hunting, river-rafting, flight-seeing, and of course mountaineering. Talkeetna is a Den’aina Indian word meaning “place where food is stored by the river”, or more poetically translated, “river of plenty”. Once in Talkeetna, there are a few more businesses for last minute shopping. Prices in Talkeetna are generally higher but supporting the local businesses helps the local small-town economy. Two very small grocery stores and a health food store may have some last minute goodies, but don’t count on being able to buy food for a three week expedition. Climbing gear stores come and go in town, so it’s best to check with your air service beforehand to see what the current situation is. Some of the air services may have some gear for sale or for rent as well. White gas or Coleman fuel can be purchased from the air services. For eats, the Talkeetna Roadhouse is by far the best bet for breakfast, and they also serve fresh pastries, homemade soup, and sandwiches for lunch. Bring your laptop for a free wireless connection. They also offer coin-op laundry and public showers. Mountain High Pizza Pie serves gourmet pizzas and calzones. The West Rib Pub and Grill is a favorite climbers’ hangout, with great beer and burgers. Sparky’s is the old standby for a variety of take-out meals. The Latitude 62 is a nice alternative for breakfast, lunch, and dinner. After dinner, the historic Fairview Inn is the local drinking establishment, often featuring live music. The West Rib is also a great place to tie one on after (or before) a hard climb. For overnight accommodations, check with your air service to see if they have a bunk-house or other lodging facility. Often, climbers are allowed to camp on the air service grounds, but be sure to check with your company beforehand. The Talkeetna Hostel International is located near the airport and is a good deal for climbers. The Talkeetna Roadhouse has convenient and comfortable rooms. The Fairview offers nice rooms, but can be very loud at night. The Swiss Alaska Inn and the Latitude 62 also have rooms. There is a bank located at the Talkeetna Spur Road junction (The ‘Y’). There are no banks in Talkeetna, but there is currently at least one local ATM. Laundry can be done at Tanner’s Trading Post. Public showers can be found here as well. A small public library offers free internet access. Several other establishments around town offer internet for a fee. Some air services offer internet access for their customers. Other local attractions include the Talkeetna Historical Society Museum, which features an intriguing 12-by-12-foot raised relief wood model based on Bradford Washburn’s Mt. McKinley map. The Talkeetna Cemetery has a climber’s memorial as a tribute to all that have died while in the Alaska Range. The Talkeetna Ranger Station is the single largest source of Alaska Range climbing information with their somewhat organized binders with route info and pictures. To really get your blood pumping, several gigantic Washburn photographs line their walls. An excellent indoor climbing wall can be found at the Alaska Mountaineering School. For a great view of the Alaska Range, follow Main Street west out to the river. All of the climbs in this book are located within Denali National Park. The Mt. McKinley National Park was created on February 26, 1917 for the protection and preservation of this unique natural resource. In 1980, the original park was designated a wilderness area and the much larger Denali National Park and Preserve was formed. Currently, all climbers attempting to climb Denali and Mount Foraker must pre-register with the National Park Service and pay a special use fee. Each member of the team is obligated to visit the Talkeetna Ranger Station in person at the time of their climb to pay the fee and have a pre-climb briefing with a climbing ranger. Climbers on other peaks in the range are encouraged to voluntarily register with the Park Service at the ranger station. In addition, all users of the park must pay the standard National Park Entrance fee. In Talkeetna there are five licensed air services that can land climbers and their gear on the glaciers within the National Park. All of the air services are located at the Talkeetna State Airport east of town, although several of them have offices downtown. The air services use ski-wheel aircraft that can land and take off on both pavement and snow by protracting and retracting large skis. These small airplanes typically hold 3 to 5 climbers and their gear, although larger aircraft being used can hold over 10 people. Contact your chosen air services well in advance of your trip for more information and reservations. Glacier landing locations and information is given at the beginning of each climbing area section. Air services may be able to shuttle parties between climbing areas. Check with your air service for availability. The North Side routes are not accessible by airplane and must all be approached overland. The Central Alaska Range is the middle section of a great 500-mile arc of mountains that sweeps across southern Alaska. The mountains sit unobstructed some 130 miles from Cook Inlet and about 430 miles from the Bering Sea, where weather systems form. It’s no wonder that the range gets some of the biggest and most feared storms on the planet. Combined with its proximity to the ocean, the huge uplift off the lowlands is a major factor to the brutalness of the weather. The mountains rise steeply from the 1,000-foot elevation lowlands on the south and the 2,000-foot tundra on the north. Denali itself has an abrupt uplift of about 15,000 feet from the head of the Ruth and Peters Glaciers. The Central Alaska Range mountains are also sub-arctic. Denali is located at 63° 04’ 10.5” latitude; 35-degress or 2,400 miles farther north than Mount Everest. This attributes to not only much colder temperatures than more equatorial ranges, but also a thinner atmosphere and lower pressures. Twenty thousand feet on Denali feels much higher and colder than 20,000 feet in the Himalaya or Andes. It should be noted that the range creates a rain-shadow effect to its north side. Talkeetna, 60 miles south of Denali, averages 30-35 inches of rainfall per year. Lake Minchumina, 60 miles north of Denali, averages just 12 inches of rainfall per year. The north side glaciers and tundra generally receive much less snowfall and it tends to be drier and the snow less consolidated in the early season. 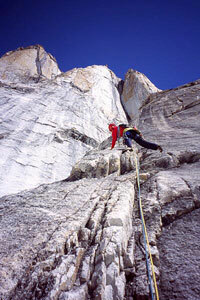 The overall climbing season in Alaska is March through September, with most ascents occurring in May and June. Winter and off-season ascents are rare but not unheard of. In general there is not a particular month that has better weather than others. There is no discernable difference between the average number of good climbing days in March, April, May, June, or July. People try to predict monthly trends in the weather but every year is different. So how does this help? Instead of planning your trip around when you think the weather is best, plan your trip on when the temperatures are best for your climbing objective. Mt. Barrill with Denali in the background. For Denali, it is no secret that the highest success rate is in June. This is a result of warmer temperatures rather than better weather. April and May can provide for great experiences on Denali, with fewer crowds, cleaner snow, and a generally more pristine environment, but chances of success go down because of the extreme cold at altitude. There have been years where there have been no summits in May until the last two days. July certainly has warm weather but the glaciers become so broken up that traveling on and even landing on the Kahiltna becomes problematic. On the other hand, April and May are generally the best time to do the lower elevation technical snow and ice routes, such as Ham and Eggs, Mount Dan Beard, Kahiltna Queen, and Mount Hunter’s North Buttress. These routes typically fall apart and become very dangerous by June. Snow mushroom and cornice collapses are a clear and present danger. In general, early season ascents may have unconsolidated snow, more snow over rock, and brittle ice. As the season progresses, snow and ice conditions generally improve but natural rock and icefall become a problem. Another consideration when planning a trip is the available amount of light versus dark. The joys of climbing in Alaska come when you are able to climb at all hours of the day and night without a headlamp. This usually comes in early May for non-technical snow routes where there is enough radiant light from the snow. 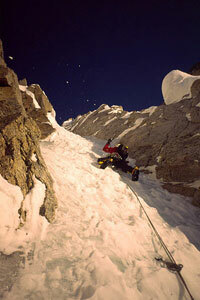 By late May it becomes possible to climb technical routes and see to place gear at the darkest hours. For rock routes in the Ruth Gorge and Little Switzerland, the season typically starts early June when temperatures have warmed up enough to melt much of the seasonal snow off the rock and it is light and warm enough to climb 24 hours a day. Match your objectives within the suitable time frame. Your best bet is to come with lots of time and lots of objectives. Be prepared to take whatever the weather dishes out. Remember, storms create the unique environment in which we climb. There are a few key weather observations that will help in predicting and preparing for storms and climbing days. The following are the typical storm events and weather systems that occur in the range. The typical storm starts in the western Aleutian Islands and tracks up the south side of the islands into the Gulf of Alaska. These storms tend to give at least 12 hours of warning, first by a sequence of high cirrus clouds approaching from the southwest. Winds increase and the sky will often turn a solid white color with a prominent ring around the sun. Eventually cumulus clouds will form and precipitation is imminent. One of the major warning signs of bad weather in general is a warming in temperature. These storms characteristically last about four days. These storms originate in the Bering Sea to the west and are pushed north of the Aleutian Islands by high barometric pressure over Hawaii. They can be the fastest and most violent of all storms. Black clouds quickly appear due west, and it may be snowing within four hours. Although not always fast and terrible, a few of these have been the worst storms I’ve ever experienced, with up to eight feet of snow within 36 hours and sustained winds of 60+ miles per hour. The longest of these storms can last up to eight days. The bane of the technical climbers wanting to get on a hard route, this weather pattern is the hardest to come to grips with. The forecast will generally call for precipitation everyday, and evil looking clouds will be constantly streaming in from the east, but long dry periods occur. The weather is never really stable, but is never usually violent either. Lenticular clouds will form and dissipate frequently. There normally will be long enough weather breaks to summit Denali or sneak up the Mini-Moonflower, but climbers waiting for that perfect forecast to get on the Infinite Spur or Hunter’s North Buttress will be sitting in base camp, watching much good weather go to waste. This weather pattern can last from one to three weeks. If there is to be a flow of weather, the best is from the north. An arctic high that forms north of the range brings very cold temperatures but generally clear weather. Conditions up high can be extremely windy and frigid for the first couple of days. Look for plumes of snow blowing off the high peaks from the north to signify a possible couple days of clear weather. If the plumes change direction, watch out for a southwesterly. A high pressure system in the Gulf of Alaska and/or the Bering Sea generally brings clear weather and moderate temperatures. It lasts from one day to a week or more. Long weather windows also tend to occur when high pressure develops over the western Yukon or northeast and north central Alaska, holding back moisture from the sea. Mount Hunter, Mount Foraker, Denali, and occasionally some of the smaller peaks, suffer from the infamous lenticular cloud cap formation. These airfoil-like clouds are created by the mountain itself and the prevailing winds aloft. The air around a mountain tends to be warmer than the mountain. Depending on its humidity or moistness, as winds collide with this air mass, it forces it over and around the mountain to create a lenticular cloud. It can be completely clear and cloudless everywhere else, except for this cloud. These clouds can form and dissipate within minutes and can be either quite violent or mild. Whiteout conditions normally exist within the cloud, and precipitation and winds can be intense. The caps usually form during the day but disappear in the evening when the air temperature around the mountain cools down. The weather is by far the most talked about subject when climbing in the Alaska Range. Don’t always trust the forecast given to you. It may be valuable for predicting general weather trends, but on a day-to-day basis it can be unreliable. This really comes in to play when climbing the smaller peaks in the range, or when making the summit push on a big route. For the smaller peaks, the unpredictableness of the weather means that the climber must always be ready. Even though the forecast may call for snow the next four days, there just may be a 12-16 hour window of opportunity in there somewhere. This may be your one shot at the Southwest Ridge of Frances or Shaken, Not Stirred. (Remember to allow for snow conditions to settle out after a big dump.) Have your gear packed and check the weather, especially at night. For rock climbing in the summer, a weather window may come in the middle of the night. For the larger less technical routes on Denali and Foraker, it is best to try and move on the lower sections of the route in periods of marginal to bad weather. Do not wait for perfect weather all the time or you will not get very far. Work on maneuvering your team into the highest possible position, then wait for the good weather to make a summit bid. On the flip side, don’t push too high in bad weather or you may become demoralized and destroyed and at the first sign of good weather, you may find yourself going down. For big long routes such as the Cassin or the West Ridge of Hunter, climbers generally wait and sit tight for a big high-pressure system to be forecasted, and then move as fast as possible to utilize it. Also be sure to consider and prepare for the range of temperatures that will be encountered. It can be downright broiling on the Kahiltna Glacier or in the Ruth Amphitheater in mid-June on a sunny calm day. During hot days down low, the best strategy is to move during the cooler nights and sleep during the day. This assures better snow conditions, safer crevasse crossings, and less risk of heat related illnesses. As you ascend higher in elevation, the schedule will eventually be reversed as nighttime temperatures become frigid. On the way to the Great Gorge of the Ruth Glacier. This book covers a wide selection of climbs and types of climbing. Packing gear for a three-week trip up the West Buttress in May will be substantially different than a one-week trip to Little Switzerland in July. Alaska in general requires high-quality pre-tested gear to combat the extreme winter conditions, temperatures, and winds. For late spring and summer ascents on snow and ice routes in Alaska, come prepared as if you were going to make a foul-weather winter ascent of Mount Rainier or an extended winter climb in the Canadian Rockies. Earlier season climbs in Alaska require an extra level of preparedness. For technical rock routes later in the season, come prepared at base camp for cold weather, but the gear taken on the climbs can be tailored to the current temperature and weather. A few equipment suggestions can be found below. Every route in this book requires climbers to carry standard glacier travel and crevasse rescue gear and be proficient at using it. Travel on Alaskan glaciers can be much more serious than on lower-48 glaciers and elsewhere around the world. High winds and heavy snowfall allow gigantic crevasses to be bridged with thin layers of snow. This combined with a lack of the freeze-thaw cycle makes these unconsolidated snow bridges exceptionally dangerous. With the increased scale of the glaciers comes increased crevasse sizes. It is not uncommon for crevasse bridges to be 30 feet wide or more. Either skis or snowshoes are obligatory. Skis are by far the safest and fastest means of glacier travel, but they can be difficult to use when roped up and handling a sled. It is best if each member of the rope team uses the same method of travel. Plastic sleds are commonly used to haul gear around. It’s helpful to practice rigging and dragging a sled before arriving on an Alaskan glacier. Sleds are generally provided for free by your air service. For all of the snow and ice routes in this book it is recommended to use expedition-style plastic double-boots with warm high-altitude liners. For elevations higher than 14,000 feet or for early season climbs, fully insulated overboots should be available for use. Footwear is a bigger concern for climbers on technical routes. Overboots can make rock and mixed climbing difficult. Test your footwear thoroughly before getting on a big climb. For a route like the Cassin in June, I find I can get by with just good plastic boots and supergaiters. Luckily on this route, the more technical climbing ends at 16,700 feet. If you need to take overboots with you, they can be donned here for the summit bid. Make sure you can easily adjust your crampons to fit with or without your overboots. For the summer rock climbing areas such as the Ruth Gorge and Little Switzerland, insulated leather boots are generally sufficient to get around on the glaciers and are easier to take up routes. Depending on the temperatures, rock shoes may need to be able to accommodate socks. For non-technical routes, a standard layering system works fine. Bring a high-quality down parka with attached hood. Water-proof breathable shell fabrics are great for cutting out the wind and snow. For technical routes, I prefer the layer-over-the-top system. Over your synthetic base layer, a micro-fiber shell is worn. When conditions worsen, insulated synthetic layers are put on over existing layers. With this method it is much easier to regulate body temperature and your clothing tends to fit better and stay drier. For routes up the big peaks and base camps, a sleeping bag rated to -20 to -30-degrees is necessary. Sleeping bag ratings are highly subjective. Ask around and test your bag out to make sure it is right for you. Most people use down bags which are lighter and more compressible but require more care and effort to keep dry. A -30-degree synthetic bag is just plain huge, but it will always keep you warm. Make sure it is roomy enough to accommodate boot liners, water bottles, camera, sunscreen, etc. Two full-length sleeping pads are a necessity. Be aware that the inflatable type can be prone to popping, rendering them practically useless. For more technical routes on smaller peaks, live by the adage “light is right.” I often use a 10 to 20-degree down bag. If I get cold, extra clothes and a hot water bottle help me through the night. To keep the pack size small, sleep on only one sleeping pad, often cut small, in addition to your pack, ropes, and other items. Here's the rack we at SuperTopo bring when we climb in Alaska. This is just to give you a general idea of what to bring. Check to the SuperTopo guidebook before climbing each route to see specifically what you need. A strong four-season dome tent for two or three people should be used for base camps and all non-technical snow and ice routes. A floorless circus-style tent makes a great cooking shelter. For technical routes requiring an overnight camp, a small foot-print single-wall tent is best. If just out a single night and the weather is good, a bivy sack may be adequate. Leave your plastic shovels at home. A sturdy aluminum shovel with a flat blade is the best for all-around use and building snow structures. A steel pointy garden blade can be useful for breaking up ice layers at the higher camps. Bring at least two shovels per tent. At least one snow saw is also a handy addition for building snow walls and igloos. A good, field-tested stove is mandatory. Your stove is your life. I recommend using a white gas model over a fuel canister model. They melt water faster, create less waste, and work better in the cold. White gas (Coleman fuel) is widely available and used in Alaska and on the glaciers. The MSR XGK model is an excellent all-around choice. Be sure to bring a good stove board to insulate the stove from the snow. White gas fuel can be purchased at any department, hardware, or climbing store. Other forms of fuel, such as propane or butane canisters, are available at most of the climbing shops. Each season white gas is flown up separately to Kahiltna Base Camp by the air services. Climbers going here must buy their fuel from the air service in Talkeetna and acquire it at Base Camp. For other landing areas or if using canisters, check with your air service for current regulations for flying with fuel. Fuel canisters generally have tighter government restrictions and are more difficult to fly with. Bring a minimum 8 oz. of white gas per person per day. White gas is typically sold by the gallon. This comes out to 16 person-days per gallon. A two-person West Buttress trip would do well with 2.5 to 3 gallons. When traveling by plane to Alaska with fuel bottles, separate the pumps or lids, rinse out the bottles, and put them in a stuff-sack with the lid off. CBs have limited functionality throughout the range, except in the Kahiltna Glacier area where they are commonly used. They provide only line of sight transmissions. Channel 19 is the most commonly used frequency and Channel 7 on the north side of the range. Airplanes generally do not monitor either frequency. Several air services will rent a CB radio or you can buy one for about $65 at an electronics or large multi-department store. Check with your air service for availability. Be sure to keep the batteries warm and carry a spare set. Although a federal license is technically required to use one, these are far more reliable than CB radios, allowing you to communicate directly with pilots. Aircraft radios should only be used in emergency situations or when scheduling a pick-up. They should not be used to check the weather or talk to other climbers. You will be talking on the same frequency the pilots use to relay their positions to other planes. Interfering with this vital communication, compromises their safety. Check with your air service for rental availability. Cell phones have limited functionality with spotty coverage in the Alaska Range. They generally work above 14,000 feet on the south side of Denali or Foraker, and from the summits of more southern peaks that are closer to the road system. Do not rely on your cell phone for your only means of communication. Sat. phones have slowly been decreasing in size and price over the years. This is by far the most reliable and useful form of communication in any remote region. Satellite phones can be rented from Globalstar Satellite Phones: 866.282.1048.